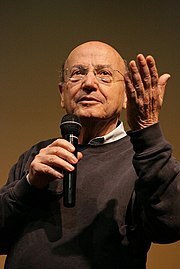 Theodoros "Theo" Angelopoulos (Greek: Θεόδωρος Αγγελόπουλος; April 27, 1935 – January 24, 2012) was a Greek filmmaker, screenwriter, and movie producer who is known for his movie Eternity and a Day. Angelopoulos was born in Athens, Greece on April 27, 1935 and studied at the University of Paris. He was married to Phoebe Economopoulou from 1980 until his death in 2012. They had three children. Angelopoulos died on January 24, 2012 in Piraeus, Greece after being hit by a motorcycle in a busy street. He was 76 years old when he died. ↑ "Director Angelopoulos dies after accident while filming". Kathimerini. 25 January 2012. Acquarello. "Great Directors: Theodoros Angelopoulos". Senses of Cinema (Issue 27). This page was last changed on 11 January 2015, at 00:40.